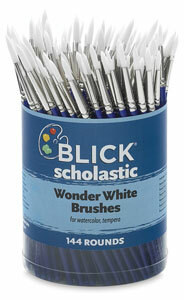 Blick Scholastic Wonder White Brushes come in a wide range of shapes and sizes for every media and application. Their White Taklon filaments deliver the texture and responsiveness of Red Sable, but are more durable when exposed to paints and solvents, making these brushes a must-have for the classroom. Available individually and in sets, every Wonder White brush has a blue gloss-finished handle attached to a nickel-plated brass ferrule. Scholastic Wonder White, Round, Canister of 144 — Contains 144 Round brushes, including 24 each of sizes 0, 1, 2, 4, 6, and 8.